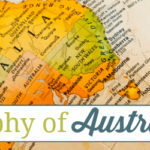 Learning about geography can be fun, but there are a lot of terms that your children need to know in order to understand what they are learning. 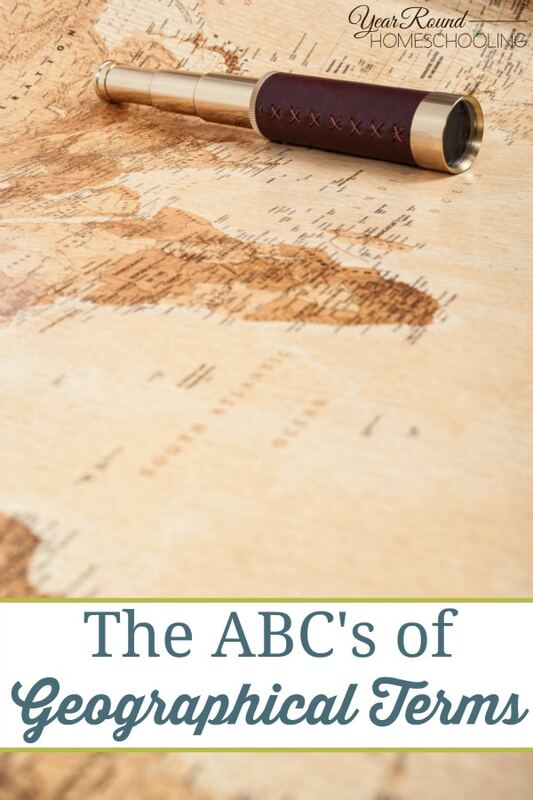 To make this easier for your students, we have put together a list of the most important geographical terms in alphabetical order! At the end of this list you’ll find that we’ve created a printable for you to download, so that your students can have the information they need on hand throughout their geography course. Abrasion – The physical wearing down and grinding which happens to a surface through impact and friction by materials carried by water, air or ice. Absolute Location – The exact spot on the Earth where something is located which can best be determined by the use of latitude and longitude angles. Altitude – An object or points height in correlation to sea or ground level. Aquifer – Formations of rock that store groundwater. Archipelago – An island group that have an arc shape. Asthenosphere – A zone in the mantle of the Earth. 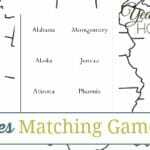 Atlas – A book containing maps or charts. Atmosphere – The Earth’s or another planets envelope of gases surrounding them. Atmospheric Pressure – The weight of the atmosphere on a surface. Barometer – An instrument that measures atmospheric pressure. Barrier Island – Islands of sand that are long and narrow often running parallel to the coastline. Bay – A sheltered body of what located in a crescent shaped coast of land. Beach – Pebble or sandy shores found by the high and low water marks especially by the ocean. Bedrock – Solid rock underlying loose deposits such as soil or alluvium. Bioregion – An Earth region that is unique due to it’s distinct soil, climate, animals, etc. Biosphere – The Earth’s regions and it’s atmosphere which are occupied by living organisms. Boundary – A dividing life that marks the limits of a particular area. Butte – A steep sided and flat topped isolated hill. Canyon – A valley with steep sides whose depth is much greater than it’s width. Canal – An artificial waterway to allow boats or ships passage inland or for water irrigation purposes. Cape – The point or extension of a piece of land extending into the water. 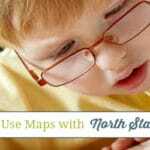 Cartography – The field of study for map creation. Cave – A natural recess that is located horizontally in the Earth’s surface. Cliff – A rock face that is tall and steep. Coastline – The separation line between a land surface from a sea or an ocean. Compass – A navigation instrument that uses the magnetic field of the Earth to determine direction. Compass Rose – A circle printed on a map or chart showing the principal directions. Continent – Continuous expanses of land throughout the world. Continental Crust – The portion of the Earth’s crust that is granitic and makes up the continents. Continental Divide – An imaginary geographical drainage divide on a continent. Contour Line – A map line which joins points of equal height above or below sea level. Core – The interior layer of the Earth. Crust – The outermost solid shell of a rocky planet. Degree – An angular unit of measure which is used to divide the spherical shape of the Earth for geographical purposes. Delta – A piece of land that is formed at a river’s mouth where the mainstream divides into many distributaries. Depression – A concave hollow found on the surface of the Earth. Desert – An area that receives low precipitation. Divide – The topographic ridge that separates drainage basins. Elevation – A point’s height on the Earth in respect to sea level. Emergent Coastline – Shoreline that is a result from a land rising in elevation relative to sea level. Erosion – The removal of weathered rocks by forces such as; wind, water and ice. Equator – The imaginary circle halfway between the North and South Pole on the Earth. Estuary – A river’s broad and lower course affected by tides and disrupted by the sea. Exosphere – The Earth’s atmosphere’s outermost zone. Fall Line – The narrow geographical boundary zone which is marked between an upland region and a plain, noted by the occurrence of falls and rapids rivers and streams crossing it. Fault – A long break in a rock. Fissure – A crack or opening in the crust of the Earth. Fjord – A long, narrow, deep inlet of the sea located between cliffs. Geography – The study of the physical features of the Earth, its atmosphere and human activities. Geosphere – The Earth’s nonliving parts; the hydrosphere, the cryosphere, the lithosphere and the atmosphere. Glacier – A thick mass of ice which is the result of compacting snow formed by more snow accumulating than melting within a year. Globe – A map of the Earth that is true-to-scale and round in shape. Grid – The lines on a map or chart that represent longitude and latitude. Gulf – A large body of water that is within a curved coastline. Habitat – The place where an animal or plant lives. Heterosphere – The upper layer of the atmosphere. Hemisphere – One half of the Earth. Homosphere – The lower layer of the atmosphere. Hydrosphere – The oceans, lakes, rivers and streams which cover the surface of the Earth. Infiltration – The movement and absorption of water downward into the soil. Ionosphere – The region in the atmosphere above 50 kilometers from the surface. Island – A piece of land that is surrounded by water. Joint – A rock’s fracture where no movement has taken place. Kettle Hole – A depression found in glacial deposits. Lagoon – Seawater that is nearly cut off from the ocean by a barrier beach. Lake – A standing body of water located on the Earth’s land masses. Latitude – The measurement used to determine the distance north or south of the equator. Legend – The key to the pictures or symbols used on a map. Lithosphere – The hard outer crust shell of the Earth. Location – An exact position on the Earth. Longitude – The measurement used to determine the distance east or west of the prime meridian. Lower Mantle – The layer of the Earth’s interior from 670-2,900 kilometers below the surface crust. Mantle – The zone found between the crust and core of the Earth’s interior. Map – A picture of a place often drawn to scale on a flat surface. Meridian – The circular arc that connects all places of the same longitude at the poles. Mesa – A hill that is isolated and flat topped with steep sides. Mesosphere – An atmospheric layer located between the stratosphere and the thermosphere. North Magnetic Pole – Where the lines of force from Earth’s magnetic field are vertical; located in the Northern Hemisphere. North Pole – Defined by the intersection of the polar axis with the Earth’s surface whose location is in the Northern Hemisphere at 90 degrees North. Ocean – Large bodies of salt water dividing land masses. Permafrost – A layer of soil that is frozen permanently. Physical Weathering – The breakdown of rock and minerals from mechanical stress. Prime Meridian – The reference point for longitude which is an imaginary line running through Greenwich, England from north to south. Region – A territory that has characteristics which distinguish it from other places. River – A channel of water that is long and narrow that flows across the Earth’s surface by the functions of gravity and elevation. Scale – The system of marks set at fixed intervals on a map which is used to indicate the proportion between the linear measurement and the actual distance on the Earth. Sea – Part of an ocean that is found on or near a continent on the Earth. Sea Level – The level of the surface of the ocean. Shore – Land bordering a large body of water. South Magnetic Pole – Where the lines of force from Earth’s magnetic field are vertical; located in the Southern Hemisphere. South Pole – Defined by the intersection of the polar axis with the Earth’s surface whose location is in the Southern Hemisphere at 90 degrees South. Stratopause – A thin atmospheric layer located between the stratosphere and the mesosphere. Stratosphere – The stratosphere is an atmospheric layer which contains the ozone layer. Tectonic Plate – A layer of the lithosphere that is extensive and moves across the surface of the Earth’s asthenosphere. Territory – A specific portion of the surface of the Earth. Topographic Map – A two dimensional map that uses contour lines to represent a three dimensional landscape. Topography – A place’s physical features. Tropic of Cancer – The imaginary northern boundary line of the tropics. Tropic of Capricorn – The imaginary southern boundary line of the tropics. Tundra – An arctic or subarctic treeless plain region. Upper Mantle – Part of the Earth’s mantle layer below the base of the crust. Valley – The low area located between mountains. Vent – The opening on the Earth’s surface where volcanic eruptions occur. Weathering – The breaking down of rocks which over time become soil. Weather Map – A map that displays the physical state of the atmosphere and its circulation over the Earth. X-axis – The horizontal axis on a graph. Y-axis – The vertical axis on a graph. Zonal – The movement of ocean waters or wind in a direction parallel to latitude lines. 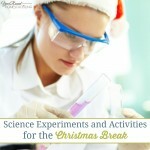 How do you make learning geography fun and easy in your homeschool?